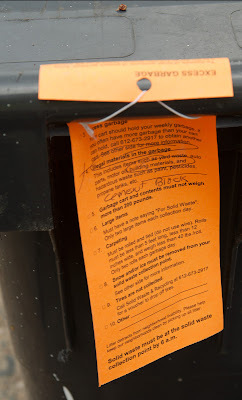 In Minneapolis, if you put bogus stuff out with your trash, you get one of these orange tags complaining about it. One of our neighbors attempted to submit some concrete pavers for trash collection, which are bogus. They received both this orange tag as well as a blue one. I didn't look closely and didn't see what the blue one was about, though, it seemed to be the same at a casual glance. About a month ago, I complained about water pouring out of the ground in front of a different neighbor's house. Long story short (Erin queried not one but two city councillors), apparently it's the neighbor's problem, not the city's, even though somehow it's related to when the city turned off a water main??? Anyway, this is our slacker neighbor, who hasn't shoveled his driveway once in two years, almost never mows his lawn, and has ten-foot weed trees growing next to his house. So I was unsurprised when it wasn't until Monday when people came by and started working (and turned off our water at a different time than the door hanger said they would, but that's a different story). But now Erin's told by the city councillor's office that something went wrong and they're not coming back for another two weeks! Yeeesh. 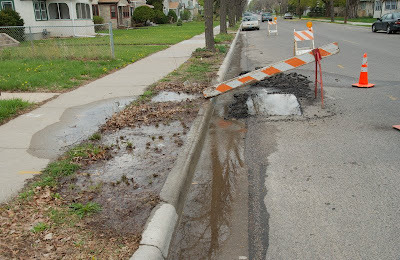 Well, today we got a note from Minneapolis Water Works saying they're turning off the water tomorrow, so maybe the thing that broke when they turned off the main is now the city's problem?